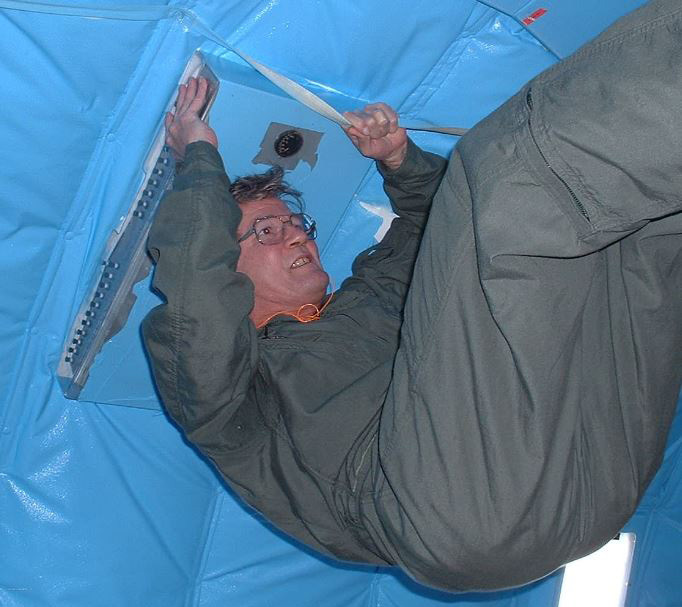 Dr. Butler, weightless in 0G, in the KC135 airplane, courtesy of Kim Prisk, MD, of UCSD. James P. Butler, PhD, is an educator at the School of Public Health and Medical School at Harvard. He has also taught abroad, in China, Japan, and Nepal, and his scientific accomplishments include authoring and contributing to more than 240 research articles, and over a dozen chapters in textbooks. His Erdös number is 3. He gravitated from elementary particle physics to pulmonary medicine as a research associate. In the midst of the Vietnam War and his opposition to it, Dr. Butler joined the Alternative Service Program as a conscientious objector. Stationed in the pulmonary division of Los Angeles County General Hospital under John Mohler, MD, and Clarence Collier, MD, he became intrigued by lung mechanics and gas exchange. Later these topics would be the center of his dissertation, and eventually they would become the major focus points of his career. He was mentored by Jere Mead, MD, Fred Hoppin, MD, and David Leith, MD, leading figures at Harvard’s School of Public Health; they had great influence on his scientific career. He would go on to emulate their work ethic, as well as their values of interdisciplinary collaboration, and intense inquisitiveness and curiosity. “It is the thrill of discovery and the unknown that draw me to research,” he says. Dr. Butler currently studies cell mechanics in the Fredberg Lab. There he observes phenomena including epithelial and endothelial cell behavior, focusing on mechanical forces that may contribute to compromised barrier integrity or unusual protective functions, and also emergent properties in cell migration. These are important to a wide variety of diseases, including asthma and Acute Respiratory Distress Syndrome. Some of his most significant advances in these areas include the interactions of cells with their microenvironment as well as with one another. He pioneered the techniques of traction microscopy and intercellular stress microscopy, which have together become the gold standard for experiments and interpretations of mechanical forces at the cellular level. These techniques are now used world-wide. Rising from the cell to whole organ level, he is currently applying some of these ideas in the investigation of new ventilatory strategies in Critical Care medicine at Brigham & Women’s and Massachusetts General Hospitals, especially for patients with ARDS. Recently, Dr. Butler extended his primary focus on pulmonary physiology to human studies of sleep-related disorders of breathing, another example of his bridging physics, mathematics, and physiology. In addition, he has made major advances in radiology, particularly in the use of hyperpolarized noble gases to study lung function. He spends about four fifths of his time in research, and the other fifth at the lectern. Immediate Past President Atul Malhotra, MD, a division chief at the University of California San Diego, is a former student and considers Dr. Butler a mentor, whom he asked to join his previous team in the Sleep Division at Harvard Medical School. “Jim spent countless hours working with early career investigators,” he says, “to help them think rigorously and to use quantitative methods. He once told me that the best thing about my lab is that there is no hierarchy and that every opinion is valued. He made students and technicians feel their ideas and suggestions were important.” Dr. Malhotra credits Dr. Butler with major contributions to the field, including respiratory function, control of breathing, cell mechanics, and lung development. Yet in light of his contributions and knowledge, Dr. Butler maintains a profound appreciation of how little we really know. He works to learn something new, no matter how small, every day. Recently, for example, he learned that it is possible, for at least one individual, to “hear” in the mind’s memory up to four long and complex orchestral pieces of music, independent of tempo and key, simultaneously. During his own graduate studies, one piece of advice stands out to this day for him. At dinner, DNA researcher and Nobelist Francis Crick, PhD, told him, “Make it a discipline to go out, take a walk, and look at the world around you. Think about everything; think about nothing.” Dr. Butler still makes it a point to really soak in his surroundings—from observing birds, trees, rain drops, or cracks in the pavement. He credits this connection to the natural world with grounding him as a scientist. In quiet moments, Dr. Butler enjoys playing the piano and watching shows on the BBC. His two favorite composers are Bach and Mozart, and he’s a fan of Call the Midwife. He is also active in his local Episcopal church and passionate about social challenges like universal health care, education for women and girls, and clean water.